This stand consists of a turned finial to the top with a shaped column leading down to an unusual double crown with shaped double hooks. This leads down to a hoop for sticks and umbrellas supported by a wide four legged base. Michael Thonet was a pioneer of the invention of the technique for bending solid timber with steam. This enabled him to become the first industrial producer of furniture on a mass scale. 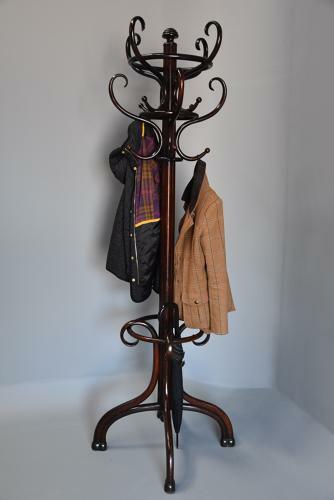 The stand is in very good condition for age, is of stable construction and can go straight into a residence - the stand has the Thonet stamp to the underside.